There’s a bad habit I’ve been trying to overcome for a long time now. Like most bad habits it’s a case of steps forward and backward. One thing I’ve found super helpful is to stop feeling guilty or beating myself up. Instead, I use ‘slip ups’ as an opportunity to be a ‘detective’ to help me improve. It’s a subtle mind shift but it makes a huge difference. Oh yeah so the bad habit? It’s ‘nibbling’ and picking at things while I’m cooking which means when I sit down to eat I’m not hungry. I’ve never been the biggest fan of snacking, but I am a fan of experimenting. So I’ve been trialling sitting down and having a proper snack when Fergal and Finbar have their dinner (at the moment my Irishman and I eat after the boys are in bed). Mostly I think it helps. But it’s still a work in progress. 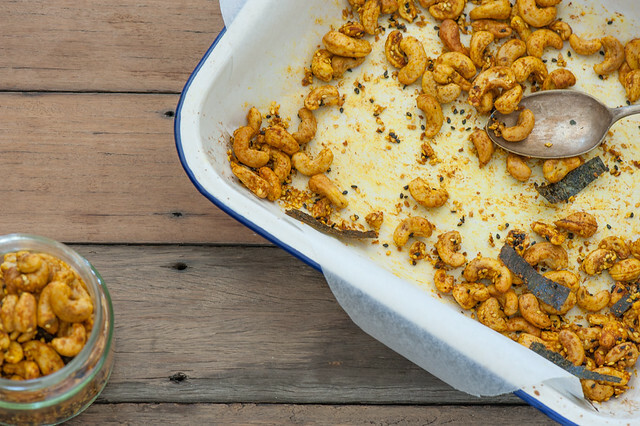 These spiced cashews are my current favourites. Although I should note they come with a warning! (see note below). This snack comes with a warning (!). The turmeric looks pretty but it does like to stain things. Especially clothes. So don’t do as my Irishman did and wipe your fingers on your jeans. The other warning is that they’re super delicious – addictively so. Don’t be surprised if they disappear much faster than you’d think. Although with all that turmeric you can be happy they’re doing good for more than just your taste buds. They also make a great edible gift. 1. Preheat your oven to 180C (350F). In a medium bowl toss cashews, togarashi, turmeric, oil and salt until well mixed. 2. Spread cashew mixture on a baking tray (I line mine with baking paper for easier clean up). 3. Bake for 5 minutes. Check and stir. If cashews are golden, remove from the heat. If you like a darker roast leave in for another 5 minutes or so. 4. Cool. Store in an airtight container. Will keep in the pantry for weeks to months (depending on how fresh your cashews were to begin with). 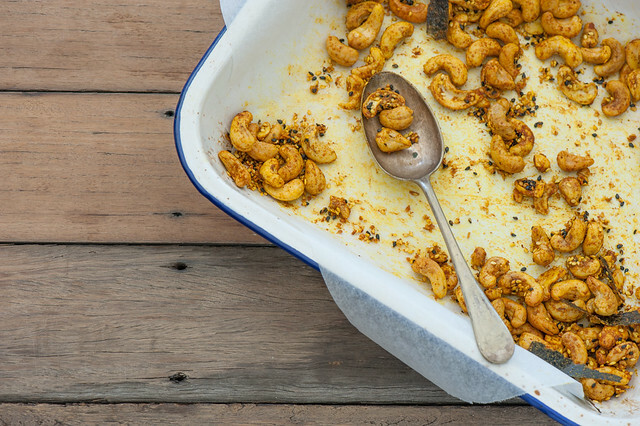 raw cashews – I usually buy pre-roasted but if you have raw cashews, just roast in the oven until lightly golden before tossing in the spice mix and roasting further as per the recipe. no schichimi togarashi – It’s a Japanese spice mix with sesame seeds, different chilli powders and occasionally some chopped nori (seaweed). It’s super delicious and if you can be bothered tracking some down you won’t have any problems finding uses for it. It’s brilliant on avocado or soft cheese (especially labneh) or poached eggs. If you don’t have any just use sesame seeds and a little chilli powder or crumbled dried chillies and if you like toss in some chopped nori but it’s not essential. no sesame oil – it adds a lovely roasted flavour but any oil you’d normally cook with will work. black pepper – is meant to help with the anti-inflammatory properties of turmeric so feel free to add freshly ground pepper to your roast nuts. no turmeric – most commercial ‘curry’ powders have lots of turmeric so you could use a curry powder instead. Got any snacks you’re loving at the mo’? I’d love to hear about them in the comments below. Wow. This appearance scrumptious, Cant wait to try them. Thanks for sharing. Hope you enjoy them Ruth! These look very yummy. I can’t wait to make these.